The Botanical Garden, originally a school project and now supervised by the local Lions Club, has received wide acclaim for its beauty and large number of species of wild plant life. A Volunteer Fire Department and an extremely active Lions Club give further proof of Kitzmiller's community spirit. The people know that prosperity will again come to their town—valuable coal is still there in the hills, and the Potomac still flows, waiting only to have its power harnessed and utilized. So the little town of Kitzmiller with two natural resources still in abundance, awaits the future, knowing with a certainty that its history is in the making. Information obtained from: Stanley Bender, L. C. Hutson, J. J. Walker; The Glades Star, No. 8, Vol. 2; History of Methodism in Kitzmiller, published by local Methodist Youth Fellowship; Kitzmiller High School yearbook, 1926. 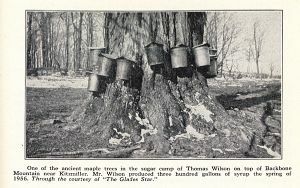 One of the ancient maple trees in the sugar camp of Thomas Wilson on top of Backbone Mountain near Kitzmiller. Mr. Wilson produced three hundred gallons of syrup the spring of 1956. Through the courtesy of "The Glades Star."